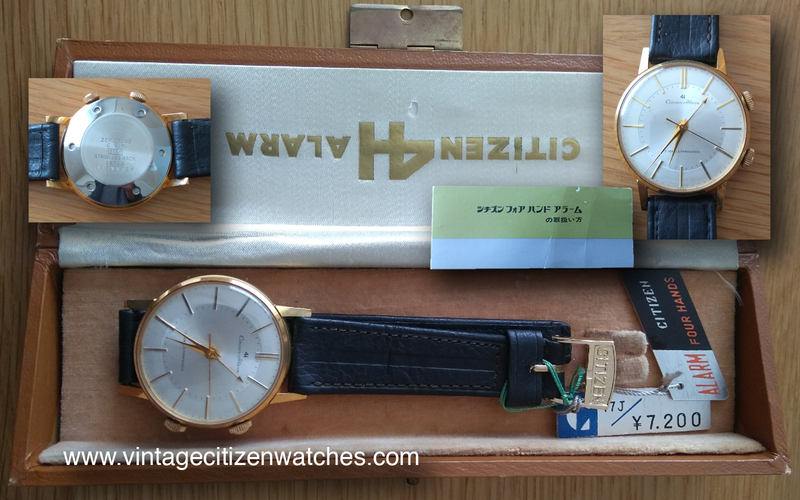 Here it is: the 1963 Citizen Alarm 4H (four hands) 17 jewels Parashock! 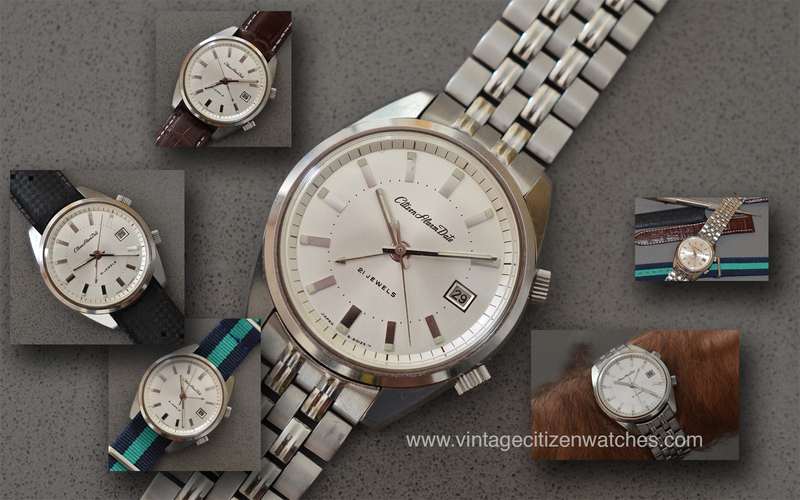 As usual, the watch is made in a polished stainless steel case, but as a novelty, it has not one but two case backs. The reason for this is that the inner one that snaps into a precise place, has a pin that is the passive part of the alarm. The hammer part of the movement hits the pin that is attached to this case back and produces the loud, powerful sound. Above this there is an outer one that has 6 round holes to allow the sound to exit more easily. This piece sits on the back of the watch without touching the inner case back so that that one can vibrate without the pressure of the wrist. Imagine a bell; if you touch it when it is ringing it wont vibrate and will stop. Holding it by the handle, all is going to be just fine. It it the same with this watch. 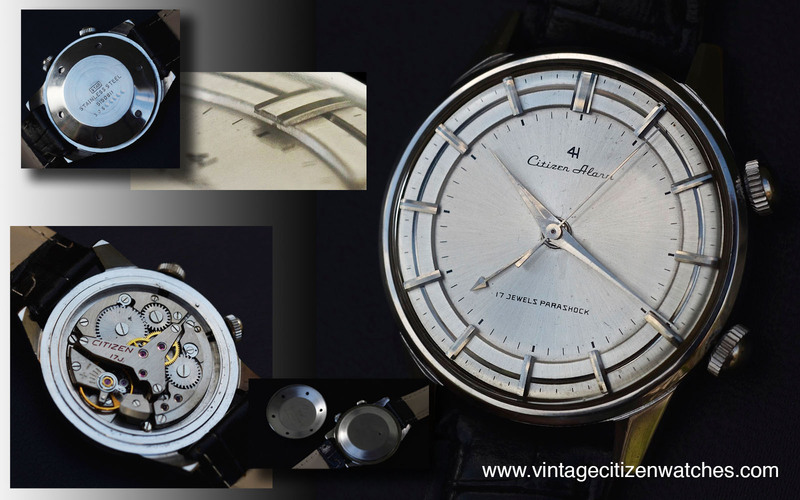 The movement is the Citizen calibre hand winding 9812 (no date), 17 Jewels working at the usual rate of 18000 bph. The crowns are one for setting time and winding the main spring and the one for operating the alarm. The crown at 2 o’clock in first position is winding the alarm and the alarm is deactivated. If you pull it in the second position you can set the alarm (counterclockwise) and the alarm is activated. Pressing it while the alarm is ringing will stop it. The crown at 4 will wind the watch and pulling it out will set the time. The alarm will ring for about 8-9 seconds. The movement has a power reserve of about 40 hours and it runs great if winding once a day. It is marked Parashock. Finally, lets talk about the way it looks! The 4 hands are polished and so are the hour markers. The dial is made out of two parts, a silver central one with a sunburst effect and an outer disk that sits higher that the central part. This outer disk has a central circular polished groove. On top of this groove are the hour markers, shaped as tiny bridges. Bottom line, it is a beautiful, loud, understated Citizen marvel, a joy to look at and a pleasure to listen to, ticking and ringing. See the video and listen to this watch HERE! Enjoy!